Coincident with the first day of Russian President Vladimir Putin’s 8 June visit to China, the team working on the Sino-Russian co-operative wide-body, long-range CRAIС CR929 airliner project, has announced a major step forward with the approval of the general layout of the next-generation aircraft. 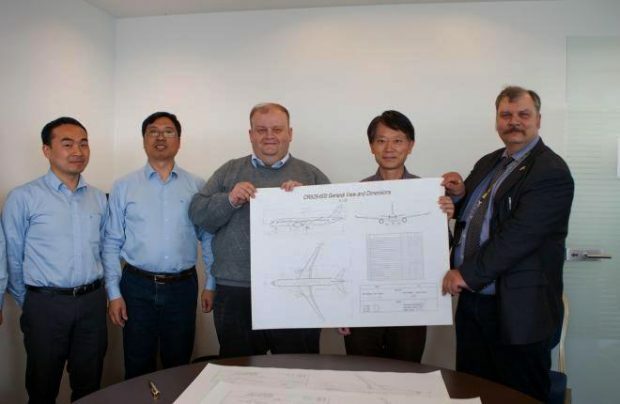 The CR929 project is managed by the Chinese-Russian commercial aircraft consortium CRAIС – a joint venture between Russia’s United Aircraft Corporation (UAC) and COMAC (Commercial Aircraft Corporation of China) – which was set up in May 2017. Approval of the general layout of the aircraft is a result of accomplishments made during the project’s engineering concept review stage, or so-called Gate 2 of CRAIС’s internal development process, by JET-team, the joint Sino-Russian engineering team headed by CR929 chief designers Maxim Litvinov, representing the Russian side, and Chen Yingchun, from China. The parties have agreed to the aircraft’s principal geometry – specifically its wingspan and shape, fuselage length, fuselage nose and tail section dimensions, aircraft fins sizing and form, the location of engines, as well as its landing gear and doors. The next step is the development of a uniform technical concept of a family of CR929 aircraft, comprising the CR929-600, the basic version capable of carrying up to 280 passengers in a typical three-class configuration; a shortened -500 version for 230 passengers; and the stretched CR929-700 variant with a seating capability of 320. “The approval of the CR929 general layout is a major step forward towards subsequent development of a uniform technical concept of a family of CR929 aircraft. This allows us to move on to the next stage of full-scale joint development of the aircraft design and systems, inter alia, in the context of liaising with the potential suppliers of aircraft equipment and components,” explained Maxim Litvinov at the CR929 general layout signing ceremony. The CR929 programme is currently at Gate 3, a definition phase. Apart from the general layout approval, this stage also includes experimental aerodynamics research work, the selection of structural materials and the analysis of technical commercial proposals submitted by potential suppliers of key systems and equipment. These works and the Gate 3 cycle are expected to be complete by mid-2019. By late May of this year, CRAIC had received seven proposals for engines for the CR929, while April saw the official commencement of the Joint Concept Definition Phase (JCDP) which is intended to promote the profound participation of potential suppliers in product definition, the optimisation of airborne systems and aircraft technical concepts. The CR929 is targeted to enter service in 2027.